James A. Michener, a popular writer of my grandparents’ generation, didn’t publish his first book until he was 39, and this was after he had served as an officer in the US Navy in the Second World War. It seems one needs about four decades of life experience in order to write a decent book. At present, the books written by those born in the middle of Generation X, such as Spencer J. Quinn (born in 1976), are just beginning to be published. What they are writing is remarkable for how it is different from the works of the recent past. A great deal of James A. Michener’s work should be seen as the view of a Pennsylvania Quaker of the GI Generation on the United States’ ascent to global power following the war, especially in the Pacific in the late 1940s. Michener creates a number of characters who are “gooks” of some kind, with an industrious, fair-minded Pennsylvanian trying to get out of all of them. In his novels, all humanity follows the same vision: it’s only the structures, policies, and/or hearts and minds that are the problem. He also created a set of archetypal characters who all came from Pennsylvania, went to another place, married a local (sometimes non-white) woman, and then took over. With Michener, it’s all semi-biographical and it always works out. In Quinn, one sees a new kind of literature developing based on life experiences wildly different from that of Michener’s generation. For Quinn’s generation in particular, America’s policies in Asia have always been of the post-Vietnam era, unlike in Michener’s, when they were formed in the period immediately following Hiroshima. Therefore, if we compare the two, Asia’s relationship with the Americans is quite different. Michener’s polite, recently-bombed Orientals who were under the thumb of American occupation have become immigrants in America itself: sullen, hostile , and taking Americans’ jobs and university spots. Generation X also never suffered the illusion that government institutions were the cause of racial inequality – in their time, the schools, armed forces, and even the Department of Motor Vehicles have always been integrated. Affirmative Action has always been a fact of life. “Civil rights” have always been government policy. Martin Luther King, Jr. has always been an object of worship. And yet things have always been a mess. The promised world of Abraham, Martin, and John  didn’t disappear; it failed to materialize in the first place. The fact that White Like You has been published at all lays bare the fraud of Michener’s integrationist philosophy and the utopian schemes of earlier generations. It demonstrates that new ideas and new circumstances gives rise to new types of artistic works. Today, the conditions wrought by multiculturalism are increasingly intolerable. White Like You’s title is an ironic recasting of that of a work of 1960s civil rights propaganda that was written by a white man who claimed to have traveled through the South in a blackface disguise: Black Like Me (1961). The story follows Ben Cameron, a middle-class professional who writes standardized test questions for public schools in a mid-twenty-first century dystopia. In Ben Cameron’s world, the United States is a believable mix of the worst elements of the early Clinton administration and the post-2012 Obama administration. The US government is effectively waging war – a high-firepower war – against the American people without regard for (white) collateral damage on behalf of an Obama-style “coalition of the ascendant” consisting of Muslims and other Third World peoples. It is Waco 1993 and Ferguson 2014 all rolled into one. 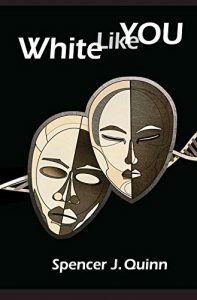 The book presents the concepts of white advocacy as well as the challenges involved in it. Ben Cameron’s personal journey begins with the problems he encounters with non-whites who are integrated into his profession, which turn him towards white advocacy. How it is described matches what I’ve experienced in my own private journey. After losing everything, Ben joins a serious, stigmatized, and underground social movement. This is a realistic allegory. The characters are often quite literally underground, communicating with each other via a coded internal network. Just like our actual movement, breaches in security – doxing – bring down a great deal of figurative, and occasionally very real, fire and destruction upon them. There is also a fictionalized study of the concepts and philosophical differences between the various elements of the white advocacy movement. There is a study of the “JQ.” There is the question of how to move forward: peaceful gatherings or violent revolution? There is also a critical study of traitors, and most importantly those who are reckless and morally unbound. “Becoming who you are” is a disaster if “who you are” is, in fact, a sociopathic criminal. A lot of important ideas are packed into this compelling story. The last two chapters in particular will serve to broaden one’s mind. It’s a bit like John Bunyan’s The Pilgrim’s Progress. It is so compelling that I can say that this is the first novel I’ve read in a very long time that I put down on the nightstand just before bed and then awoke early the next morning to finish reading. Two are Pentaquod (Chesapeake) and Levi Zendt (Centennial).